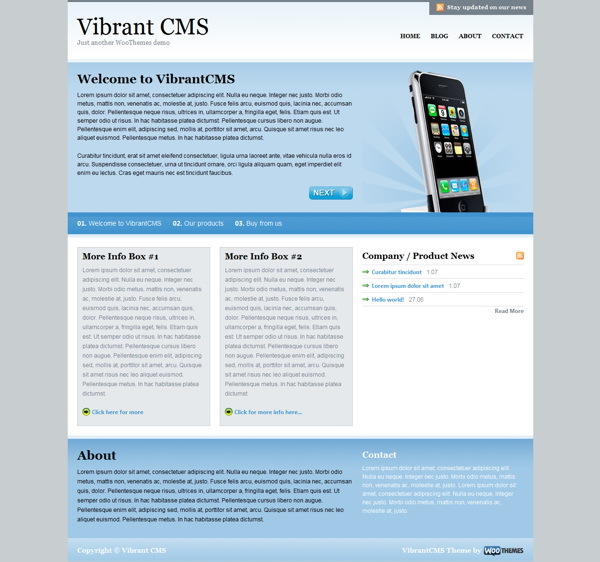 VibrantCMS is our first theme targeted at businesses. The design incorporates some recently popular usability trends (like the featured info scroller on the homepage), which should propel your business into the new online space, whilst creating a new market for your goods. The theme has an easy-to-use featured scroller to broadcast your business’ most important information, a separate company blog that is tucked away from the homepage; and 20 amazing color schemes that will definitely fit with your corporate branding. Making simple changes without editing code, like adding your own logo, changing to an alternate color style, adding Google Analytics code, couldn’t be easier with the back-end theme options panel. The theme is compatible with all the modern web browsers like Firefox, Safari, Chrome and Internet Explorer. There is an image resizer script built into the theme framework to automatically scales your post images for pixel perfect display in our templates. No need to upload new cropped images when re-designing your website. It comes packaged with a .po file for easy WordPress theme translations into your desired language – editing one neat little file without hunting down text in the theme templates.